The other day I was looking at some of our presentations of previous case studies when I came across two from the fall of 2008, from the Cases on International Business Strategy (CIBS) course. We have written many posts about the so called Business Economics pyramid. 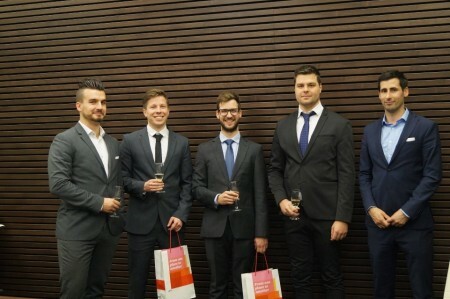 During university classes I often emphasize that the semesters of the Cases on Business Economics and the Cases on International Business Strategy comprise the most intensive period of the bachelor studies of the faculty of business administration. I would like to demonstrate this sort of development with three slides. There are two things in common for the three slides: 1. they were all made by Attila Lapinksas and I and 2. they contain traces of Porter’s five forces analysis. 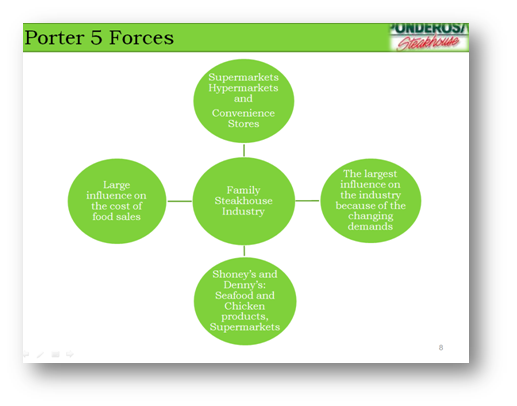 The first sample slide is from our CIBS presentation of Ponderosa steak house. Looking at the slide from a certain distance, one can immediately see that it is about a Porter industry analysis. We excluded only the arrows pointing in the direction of industry rivalry and the name of the forces. Besides the bubbles being too crowded and meaningless content-wise, the biggest problem is that this analysis was the 8th slide of our 20-slide presentation. Another major issue is that it is not clear for the audience what to do with this slide. So what? – could the jury ask as the message of the slide is not absolutely clear. Our next example is from three months later, from the CIBS final. 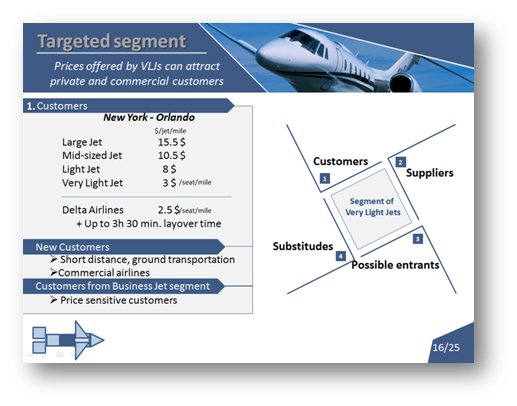 Here we solved the case of Jets International with our team. For the first look we can see that it is about a company’s target group and the team is analyzing the threat of substitutions for the different products. If we look at the figure on the right side, we may notice that in terms of appearance it does not look like Porter. In case we are examining the categories (regardless of their order) there is an evident reference. The unique order supports the logic of the oral presentation. 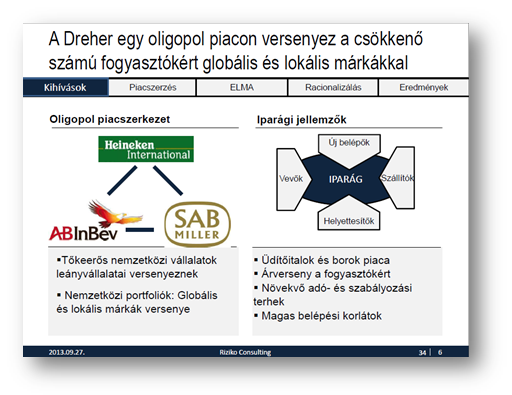 The thirds slide was made 3 years after CIBS, for the Corvinus final of the XIII National Case Study Competition where we had to solve a case on Dreher Breweries. This slide is converging to the style used by consultants both in terms of appearance and content. The main message of the slide is supported by several analyses one of which is Porter’s five forces. The actual analysis is not on the slide only key words and the silhouette of the model appear. We put the detailed analysis on a back-up slide. I wanted to demonstrate through these three slides above that no one becomes an advanced case solver overnight. The university and other methodological trainings provide an excellent opportunity to acquire knowledge and improve presentation skills. However that is not enough as case study solving is traditionally a learning-by-doing activity. The more competitions you participate in the more you will put yourself and your team under pressure generated by competition and the faster and more efficient you will be at solving business problems in a structured way.